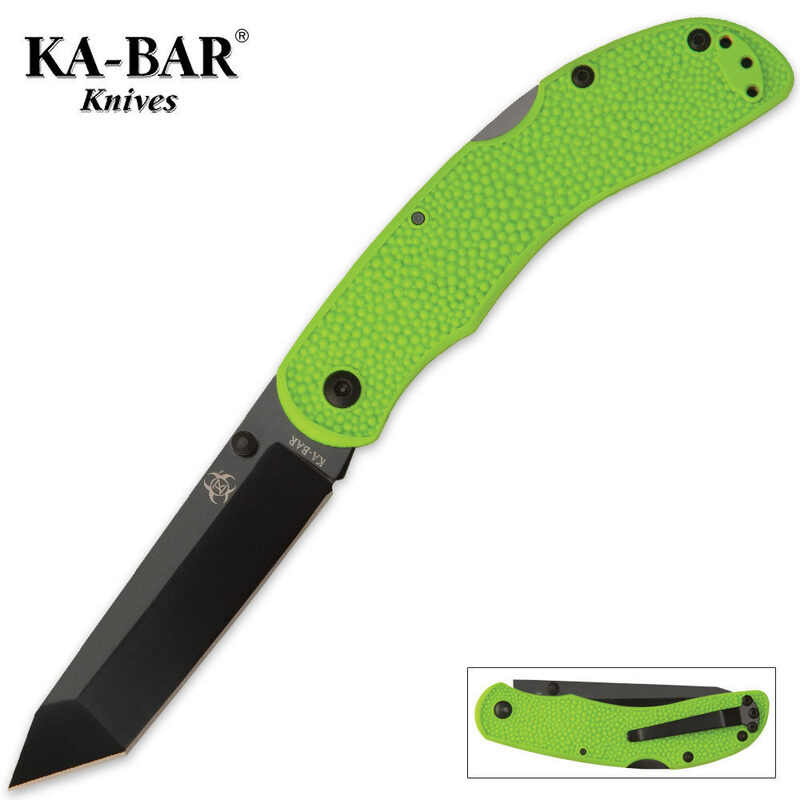 KA-BAR Zombie Killer ZK Kharon Tanto Pocket Knife | BUDK.com - Knives & Swords At The Lowest Prices! KA-BAR named the Zombie Killer line after its top officials joked about the need to design knives capable of killing a zombie when firearms aren’t available. The ZK Series is designed to protect without fail in any situation. Just got mine today [good shipping as you'll hear a lot in reviews] box it came in was kinda rough but the blade inside was brand new a little smudged but it wiped off with a breath and a wipe on the shirt. blade is sharp enough to cut paper right out of the box, has a thumb stud on both sides which is a very nice feature, and is perfectly sized for the hand [a little small feeling compared to my large kabar but that ones huge], locks up really tight and releases well. pocket clips on the right so it doesnt feel very well on the left pocket but is drilled so you could probably take it off and switch it if you where so inclined. handle material feels good in the hand for a plastic, only complaint is it kind of chafes your fingers where the blade goes when its open but that happens. overall an excellent knife well made [in taiwan out of 5698 steel] lightweight and sharp out of the box comes with a Ka-Bar lifetime warranty against defects or failure under normal use [basically as long as you dont try to break it they'll fix it] so its well worth the price and should last you forever its going to be my new everyday carry knife.